Elizabeth entered a monastery when she was only twelve and soon became a Benedictine nun. Sometimes, she would get visions of the Lord, angels, or saints. She would tell what she had seen to her brother Egbert, who was a priest. He put it into writing and later published her visions in three books. In one vision, she saw the Blessed Mother dressed in white with a purple mantle (or cloak), wearing a fancy crown. 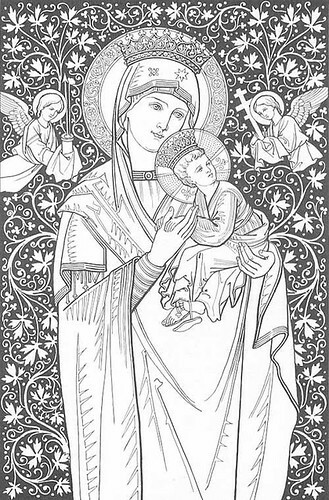 Today, color your own vision of the Holy Mother. Will you color her in white with a purple mantle, the way Saint Elizabeth of Schonau saw her? Or do you see her in wearing other colors? Here is a coloring page to download, plus a more intricate version for kids with a little more coloring experience. Or, use plain paper and draw from your heart. 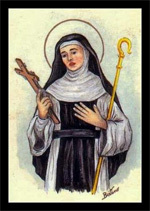 Saint Elizabeth of Schonau, pray for us!